While fingernail health is not necessarily a part of traditional palmistry, looking at the fingernails can provide a lot of information on someone's health. This article presents a small sample of fingernail health conditions that may help identify ailments, however make sure you seek professional advice before acting on those suggestions. In order to evaluate your fingernail health, you have to know what a healthy fingernail looks like. It takes about 6 months for a nail to grow. Therefore specific markings such as spots or horizontal ridges will give you the timing of the corresponding trauma. The fastest nail to grow is on the middle finger, then the index finger and then the ring finger. The nails of the active hand grow a bit faster than on the inactive hand. To be significant, any specific shape, color or marking needs to appear on more than one fingernail. An explanation of white spots on fingernails is presented here. Imagine you take a needle and poke little holes everywhere on your fingernail plate. The result would look a bit like the surface of the Moon, with all kinds of tiny craters. This is what fingernail pitting looks like. Pitting is related to skin conditions. If the pits are random, it may indicate psoriasis, a skin condition that produces scaly patches. If the pits look like a geometric grid, it may be alopecia areata, a condition that causes round patches of hair loss. They can also reveal eczema and rash on the skin or in the mouth. They may also result from nail injuries. 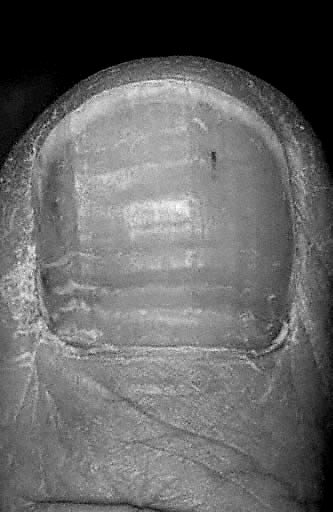 Ridges are vertical indentations going from the bottom of the nail out to the fingertip. They are very common and indicate anxiety, stress and are sometimes an early warning of rheumatic and arthritic disorders. I read somewhere that "if you have ridges on your nails, a buffer can make your nails nice and smooth." I entirely disagree! If you use a buffer, your nails are indeed going to look good for a little while. However, this process actually cuts into a nail, which is already thinner at the ridge location. It will break your nail vertically once the nail plate grows out, and the splitting may continue until the nail has grown the full length of the buffed part. So please don't use the buffer on ridges. Sometimes, there is a middle ridge that splits the nail and gives it a fir tree appearance. It is often a sign or severe arterial disease. In some cases, it could suggest malnutrition or repetitive trauma. No, they don't mean you have a beau! They were just first described by Joseph Beau. They are deep grooved lines that run horizontally, as opposed to the ridges that run vertically. 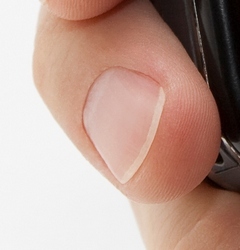 These lines show up when growth at the area under your cuticle is interrupted by injury or severe illness. There are many reasons for their appearance: uncontrolled diabetes, circulatory diseases, such as peripheral artery disease or heart attack, high fever, pneumonia, scarlet fever, mumps or measles, low blood pressure, low calcium levels, malnutrition, shock and surgery. The time of event may be determined from the location of the lines on nail. In the case of the clubbed fingernail, the tip of the finger swells like a drumstick and the nail looks like a dome. Its color is often bluish. This condition results from low oxygen levels in the blood and could be a sign of lung disease. 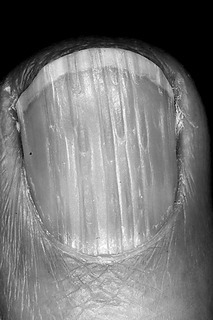 When more than three digits present a clubbed nail, the illness may be severe or advanced. 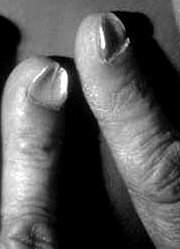 Fingernail clubbing can be associated with pulmonary and cardiovascular diseases (80%), gastrointestinal troubles, such as an inflammatory bowel disease (about 5%) or an overactive thyroid (about 1%). Raynaud's disease, i.e. a disorder causing discoloration of the fingers, protein deficiency or exposure to petroleum-based solvents. There are many reasons why a fingernail would become loose, including trauma, injury or infection, thyroid disorders, psoriasis, eczema or blistering from an autoimmune disease. Also, a loosening fingernail may be a reaction to drugs, solvents, nail hardeners or acrylic nails. The moon (or lunula) is always present on the thumb. When the moon is absent on other fingernails, it shows that aerobic capacity and circulation aren't optimal. It could also be related to anemia or malnutrition. Red fingernails could be caused by a heart disease, Systemic lupus erythematosus. an autoimmune disorder, angioma, i.e. an abnormal growth due to the dilatation or new formation of blood vessels and malnutrition. If they are dark red, it could be polycythemia, i.e. an abnormal increase in the number of blood cells, and if they are cherry red, carbon monoxide may be the cause. They are often related to a respiratory condition, or anything that slows down the growth of the nail such as diabetes, protein imbalance, nerve injury, burn injury and jaundice. They can be caused by anemia, edema, or vascular conditions, such as low hemoglobin in your blood). Other conditions may include renal failure, cirrhosis, diabetes and chemotherapy. In some rare cases, white fingernails may be hereditary. Any acute illness can produce transverse milky white lines. In addition, those lines might be caused by an excessive build-up of metals in the body (classically arsenic) or chemotherapy. The time of event may be determined from the location of the lines on nail. If you are interested in finding the meaning of different shapes of fingernails, check this article.